Over 6 Billion searches are made online every day and a whopping 77% of them on Google. So, it makes sense to take advantage of any functions that help you get noticed on Google. Google My Business (GMB) is a free resource that can help drive traffic to local businesses. 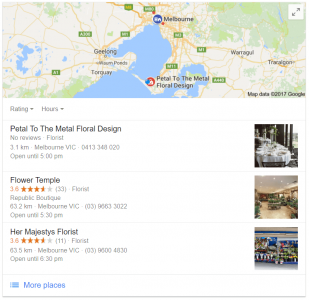 If you’ve previously used Google Places – GMB is the updated version. Simply put, GMB is a tool that allows Google to list your business and connect you with local customers. It’s like Yelp or Yellow Pages, but it has extra features that make it much more than a simple business listing. Plus – did I mention – it’s 100% FREE?! You can link GMB with your existing website. It also connects your business details with Google Search, Google+ and Google Maps. How can you benefit from GMB? The short answer is – yes! Not only is it free to use, it’s also got an array of great features which can translate into extra $$$ for your business. Gone are the days when flicking through the Yellow Pages or an advert in the paper were the main ways people found local services. People are increasingly using the ‘near me’ function when conducting searches online – especially on their smartphones – with a huge 80% of ‘near me’ searches happening on hand-held devices. 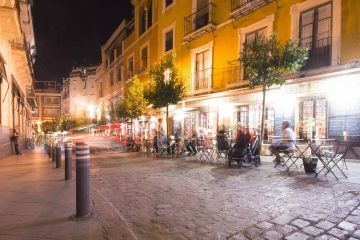 Having an easily accessible listing that people can see when they go into Google maps or search ensures that you get the best chance of being found by local customers. Being in the “3-Pack” can supercharge your visibility. GMB can help you land a space in what’s known as the “3-Pack” on Google search results. Have you noticed that when you search for a business in Google you get paid ads for the top three results, but you also get a local map which has businesses listed underneath? This is thanks to the magic of GMB and landing in the sought-after “3-Pack” can supercharge your visibility. The best bit about being part of the “3-Pack” is, unlike the top three paid advertising slots this is totally free – blowing your traffic sky high – without having to spend a ton of money! Only 37% of businesses have a GMB listing – despite 97% of customers choosing to search locally for goods and services. Add that to further functions that allow you to engage your customers and you have a service that’s well worth taking advantage of. With a full GMB listing you could easily find yourself grabbing business out from under the nose of your competitors. List all your essential information and even get reviews. On GMB you can list your location, hours of business, contact details, website and directions on how to get to you – all essential information for new customers. There are also extra features like the ability to leave reviews, put up posts and to have a Q&A section – all of which give a great snapshot to potential new customers. You can update Google posts to show recent offers, incentives and activities in your business. If you’re running a special event or a limited time discount then adding a Google post to your GMB listing can help drive customers to your door! A word of caution – take care that you don’t use posts simply to push sales or offers. Google prohibits the use of super spammy sales and offers. So make sure to keep it organic and part of an informative conversation with your customers, rather than an outright Ad. 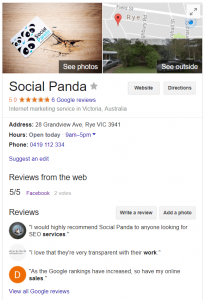 Convinced that Google My Business Listing as an asset to your online presence? Follow our easy guide to claim your GMB listing now! For personalised information on how you can use GMB or other SEO tools to grow your business impact get in touch – we offer free SEO reviews!